* A fingertip device that measures blood oxygen saturation(%SP02)and pulse rate. Designed for sports enthusiasts; including mountain climbers, hikers, skiers and bikers. * The Finger Pulse Oximeter shines red and infrared light through a finger and detects the fluctuating signals caused by blood flow. Pulse rate is determined from the signals received by a light detector. The ratio of the fluctuation of the red and infrared light signals is used to calculate the blood oxygen saturation of hemoglobin. * Blood Oxygen Saturation (%SpO2): Displays percent oxygen saturation of blood. * Pulse Rate: Displays the number of pulses per minute. * Pulse Quality: Blinks green, yellow, or red to indicate changes in pulse quality. 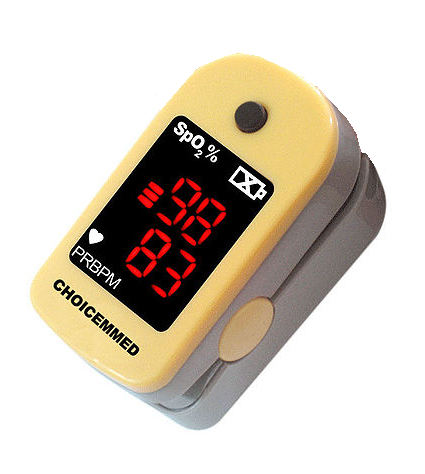 * A pulse oximeter tells you what percent of your hemoglobin molecules are carrying oxygen - your blood oxygen saturation or %SpO2. A %SpO2 reading of 97 tells you that 97% of your hemoglobin molecules are carrying oxygen. * Two AAA-size batteries power the SportStat for approximately 1,600 spot checks. When the batteries are low, the numeric displays flash once per second. The SportStat will automatically shut off (to conserve battery life) approximately 10 seconds after a finger is removed. SportStat's advanced digital circuitry requires no adjustment (calibration) or periodic maintenance other than battery replacement.